You can download assembly instructions for our single hutches here. You can download assembly instructions for the MultiMax group hutches here. You can download detailed recommendations for hutch use and layout to make sure you comply with UK law and assurance schemes here. Place hutches and service aisles on a well drained surface with a slight slope. Recommended materials for the site include gravel, crushed stone or sand, but well drained concrete also works fine. Face hutch entrances away from, or perpendicular to, prevailing winds; hutch position should allow for maximum winter daytime sunlight into pens at the front of the hutch. Prepare a large enough site to allow for rotation of hutches to fallow areas. This provides a break in the life-cycle of subterranean micro-organisms. Place one MultiMax in a small pasture and rotate the hutch and pen periodically. (A worming regime would need to be considered at grass). Place multiple MultiMax hutches in a large pasture with bigger groups. Position hutches near to each other as the herd will not separate to housing in different locations. Allow an area of 5.5m x 3m for each Multimax hutch and pen. If you can't find the information you need here, please give us a ring and we will be happy to advise you on your individual requirements. Using these hutches we have almost eliminated pneumonia and scours are rare. The airflow is excellent, the calves stay cool in summer, warm in winter and wear and tear has been minimal. We are delighted with the calves' performance. I recommend hutches to everybody who comes on the farm. Tom Horton who runs the 400 cow pedigree Holstein Hinton herd in Wiltshire. 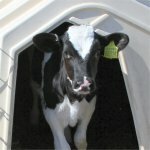 See pictures of our hutches in use on farms across the UK.